Pneumatech is a global leader in the quality air business with more than 50 years in the nitrogen business. The Pneumatech brand is associated with quality and high level of innovation. 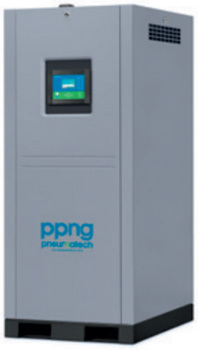 The Pneumatech nitrogen generator is a newly developed product to fit the increased demand for nitrogen supply at our customer’s site. In order to safeguard the environment from the unnecessary transport of gas tubes and obtain a flexible supply of nitrogen, many companies switch to on-site gas generators. The most cost effective, long-term solution to provide nitrogen is installing an on-site gas generator.